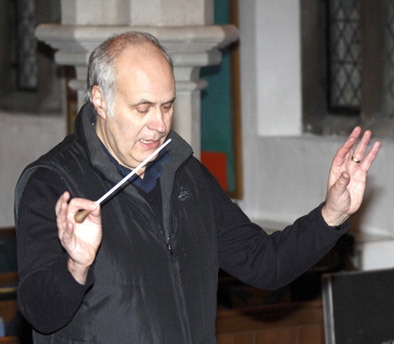 The conductor of the Stapleford Choral Society is Adam Pounds who was born in London in 1954. During his period at music college, he took conducting lessons from Christopher Fry and he continued his musical education at Goldsmith's College, London University where he achieved his B.Mus. After moving to Cambridge in 2000 he completed his Masters degree at Trinity Hall. Adam has over thirty years experience of conducting both amateur and professional orchestras and choirs and during this period he has covered a wide repertoire. In 2007 he founded the Orchestra of Great St. Mary's and the orchestra often plays for the Stapleford Choral Society as well as giving regular concerts at the University Church. Adam is also a composer and was a private student of Sir Lennox Berkeley. His output as a composer is extremely varied, ranging from small scale choral pieces to large-scale orchestral works. Commissioned works have included The Martyrdom of Latimer (2009) which was premiered at Ely Cathedral and was warmly received. More details about Adam's musical activities including extracts of his music can be found on his website at www.adampounds.co.uk.